This is Oblong Inernet Cafe, Cuba Street Wellington, run by and for Wellington's anarchist community. 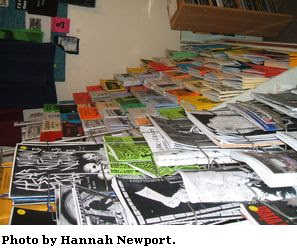 It is often used as a meeting place by the activists running anarchist newsite, Indymedia. 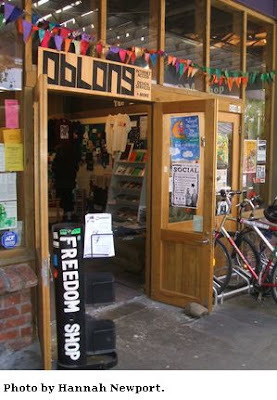 Inside is the Freedom Bookshop where one can buy anarchist books,'zines and posters. Geoff Karena, who claims to be friend and relative of "Urewera 17" arrestee, Rangi Kemara and who advocates suicide bombings and war on pakeha recommends Indymedia and the Freedom Bookshop. come along to a hui at your local freedom shop or go to anarchy.com indymedia, www.tinorangatiratanga.yahoogroups taitokerau@yahoogroups.com or googlise fro the "poor mans James bond" book, buy the book set up a cell and select some suicide bombers go to it. there are detailed video's on how to make suicide vests in it oye oye for the cause. go to the one in wgtn at the oblong left bank cuba street that’s where you can find out about the fake us, canada, america and english pernicious resource stripping war mongering industrialists nations and how to overthrow them. I'd like to ask the Wellington anarchists who occasionally comment on this Blog, such as Sam Buchanan and Asher Goldman if they endorse Mr Karena's statements? Are you proud to have someone who seems to recommend suicide bombing and civil war associated with your news site and bookshop? Considering that several of your friends and colleagues were recently accused of involvement in terrorist related activities, surely you would want to distance yourself from Mr Karena's writings? You are both involved in the peace movement-surely you must strongly oppose Mr Karena's apparently pro-violence views? I am happy to post your replies unedited-defamation excluded of course. yeah how about answering the issues instead of ignoring them as you usually do? I won't hold my breath Trev. These types of people have never yet given any straight answers on this blog or in the media yet. Stretching it a bit here aren't you, Trev? If you have issues with Mr Karena shouldn't he be the one you approach for comment? Or is this you're socialist streak coming through again - your deep tendency to group people together and hold them collectively responsible for each others views? I wouldn't expect you to take responsibility for what other people say, so why do you (and your grammatically-challenged, anonymous and pseudonomous friends above) expect me to? By the way, you still haven't replied to my offer to correct the errors in your piece about me, and the mis-lablelled photos you still have up, for a reasonable price. This seems a bit irresponsible of you. However, here's something for free - it's already in the public domain anyway. A short piece I wrote for a newsheet at the time of the public transport bombings in London a few years back. It also refers to the idiots who grafittied an Auckland mosque in response. it's somewhat terse, and the language is a bit untypical of me, but I was pretty angry at the time.